When I traded my beautifully-driving $1 Oldsmobile Alero to my landlord for his totaled 2003 Kia Rio, I thought I was giving him the deal of the century. But last night, he came knocking on my door to deliver some scary news: his brakes went out. “My brakes are very weak,” my landlord told me, asking if I could help fix his daily driver. When I inquired if the car’s brake pedal sank to the floor, he answered affirmatively, and my heart sank. “Oh god, what happened? Is he okay? Is the car okay?,” I worried. But before I could ask any of that, my kind neighbor told me nonchalantly that the car was in the garage, and that I should take a look whenever I had a chance. When I told him I’d look in the morning, he agreed, but then came back an hour later to insist that I take a peek. I walked to the garage and looked under the Olds; the floor was dry. So I hopped into the driver’s seat, and pressed the brake pedal. When it offered little resistance, it became clear that there was definitely a hole in the brake system. We popped the hood and opened the brake fluid reservoir, discovering it to be nearly empty. So we filled it with DOT 3, and my landlord pumped the brake as I sat under the front cradle, looking for moisture. It took no time to spot the culprit: a rusty brake line running east-west along a part of the car’s front subframe, shooting a strong stream of clear fluid right onto a wiring harness. Knowing that the car’s front and rear brake systems are separate, I carefully drove the car into my driveway relying only the rear brakes. 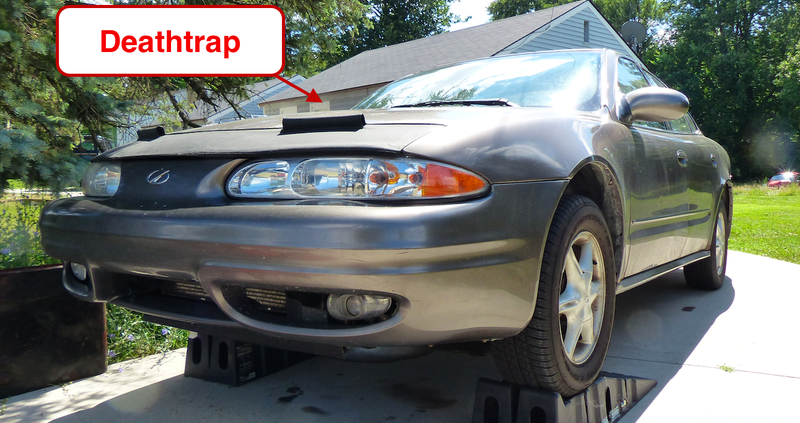 Then today, I inched the Alero onto some ramps to have a closer look, and to have better access when I install a set of new, pre-formed brake lines. Those corroded ones have got to go. I feel bad, because I knew there was some corrosion on the brake lines when I traded the car, as is fairly standard on Michigan cars. I had caught a glimpse of the lines surrounding the ABS module when I swapped out my radiator a few months ago, but to me, that looked like mostly surface rust. Looking at it now, that’s clearly some scaly stuff, so it’s really no surprise that lower down in the vehicle—where brake lines are heavily exposed to road salt and dirt—there was a hole. I realize that in some ways, it’s the buyer’s responsibility to understand the condition of their car, but I definitely feel bad on this one. I’m fairly sure I mentioned the somewhat corroded lines when we made the Olds-Kia trade, but perhaps I didn’t, in which case I’d basically be a monster. Did I expect them to be that bad? Definitely not. But with stuff like this, I should have inspected the parts more closely, and then either replaced them or continually reminded my landlord take care of them. Because having no front brakes is just downright dangerous. Luckily, no harm was done and I'll have new brake lines in before the car goes back on the road.